1400 4 1/2" Test Gauges feature a solid front case for safety, knife-edge pointer and mirrored dial and adjustable pointer for front zero adjustment. 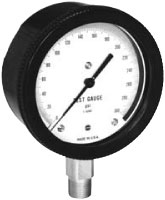 IPS Offers many other styles of pressure gauges for virtually any application. Quantity Discounts Available for 10 or more, CALL.